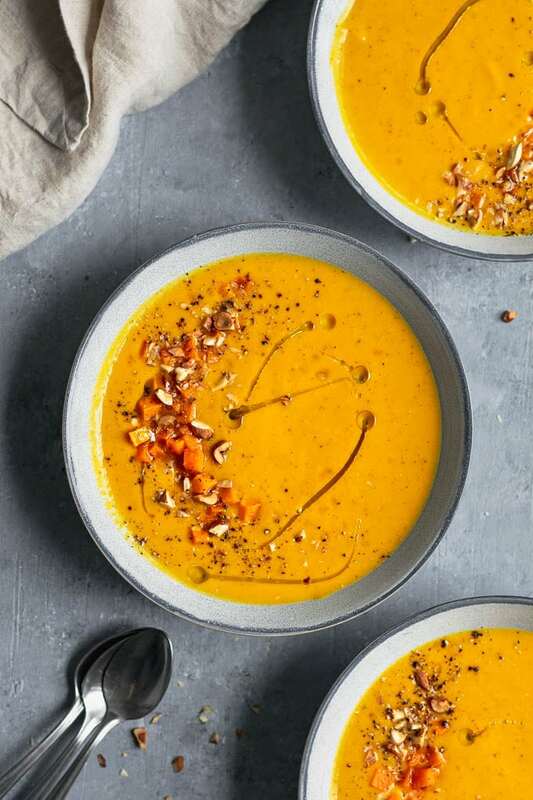 There’s nothing fussy about this butternut squash almond bisque. It’s one of the simplest winter squash soup recipes I’ve made, and yet it remains my favorite. Creamed winter squash scented with warming ginger, cinnamon, nutmeg and freshly ground black pepper. This luscious butternut squash soup been on our thanksgiving menu for longer than I keep digital notes for (what you don’t have google docs of your Thanksgiving menus dating back to 2009? ), and each year we put it back on the menu. 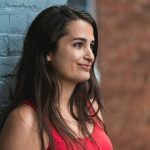 I’ve had so many Thanksgiving and Friendsgiving guests ask for the recipe over the years, it would have been cruel to keep it to myself any longer! This bisque is light and flavorful, with a thick and creamy texture. The creaminess is mostly from the squash, in this case no plant based creams are needed for the butternut soup of your dreams. 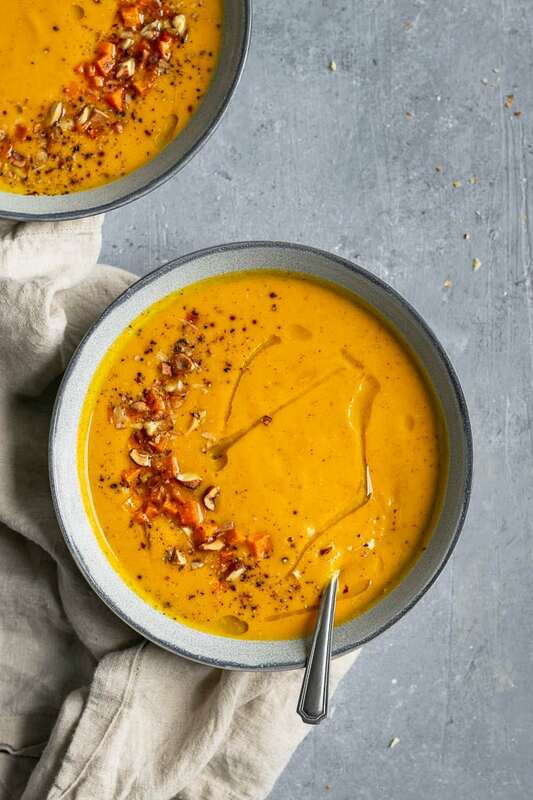 A scoop of almond butter adds just enough nutty richness, complementing the veggie-forward soup. 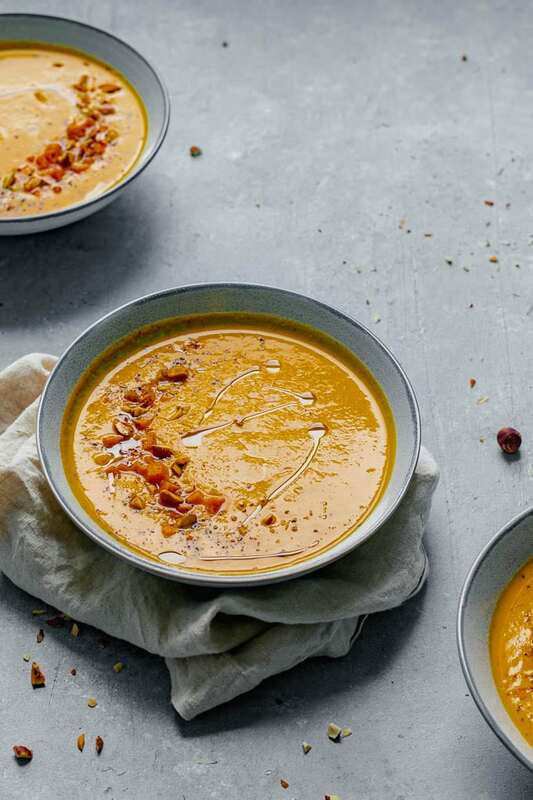 Making this butternut squash almond bisque is as easy as can be. We start with the basics of great French cooking–a mirepoix. Onion, carrots, celery are cooked over medium-low heat until soft and sweet. In this recipe we add ginger right at the beginning, because 1) being different is great, and 2) it infuses the zesty and spicy ginger into the base of the soup. Yum! The generous amount of fresh ginger cooked into this soup is one of it’s best (not-secret) secrets. It’s brings a freshness and spiciness to the bisque and the flavor deliciously complements the sweet butternut squash. The mirepoix is cooked slowly until the onions are translucent and the carrots are soft. We’re not trying to brown them, so keep an eye on it and stir semi-frequently. If they start to caramelize turn the heat down a little, and if the ginger stubbornly sticks to the bottom of pot deglaze with a splash of broth. Once the mirepoix has softened and sweetened, add the butternut squash and cook it for 5 minutes, letting it pick up a bit of color and start to soften before adding the vegetable broth, soy sauce, salt, cinnamon, & nutmeg. Soy sauce might seem like a strange ingredient for an autumnal soup, but it adds a salty and umami flavor, which deepens the flavor of the bisque and makes it taste richer. Cinnamon and nutmeg are ideally used from the whole spices for their best flavors, so toss in a stick of cinnamon and grate part of a nutmeg pod directly over the pot (it’ll still be delicious with pre-ground spices if you need to substitute). The soup simmers just about 10 minutes before the squash is tender. Then remove the cinnamon stick (even if you aren’t blending right away you don’t want the cinnamon flavor to become too strong) and stir in the almond butter. Almond butter is nutty and a little bitter which balances the sweet flavors of the squash, rounding the bisque out. Once blended it adds just enough creaminess to enhance the natural creaminess of the pureed squash. An immersion blender makes quick work of blending the hot pot of soup, but I’ll admit I loooove using my Vitamix to make a smooth and perfectly even textured soup. Either works. That said, if I’m doubling the recipe or more for a big thanksgiving dinner there’s no way I’m doing anything but using my immersion blender. Depending on how salty your broth was, you might need to add more salt. If the soup tastes flat, it definitely needs a bit more salt! And that’s it! The soup is done! For a pretty presentation and to enhance the flavors of the soup I like to garnish with chopped toasted nuts, and if I’m feeling extra fancy some roasted squash as well. You can roast petite cubes of butternut squash while the soup cooks: toss the squash in a thin coating of oil and a sprinkling of salt and bake at 375 ºF for 15-ish minutes until tender. Go ahead and toast those nuts alongside the squash. I like to use almonds and hazelnuts, and here I used a mix of the two. Toast for about 7-10 minutes at 375 ºF until a shade or two darker and fragrant. Chop up and sprinkle over the soup along with the squash! A drizzle of olive oil & a couple grinds of peppercorn never hurts, and chives are my personal favorite herb for this soup if you want to go that route. This soup couldn’t be easier to make! As written, the recipe makes quite a bit of soup, but if you find yourself with a crowd, it doubles or triples easily! I suppose you could always cut the recipe in half if you’re just 1 or 2 people. Or be like me and text your friends in a panic that you’ve made too much soup and please come over for dinner to help out! Trust me, they happily will oblige. 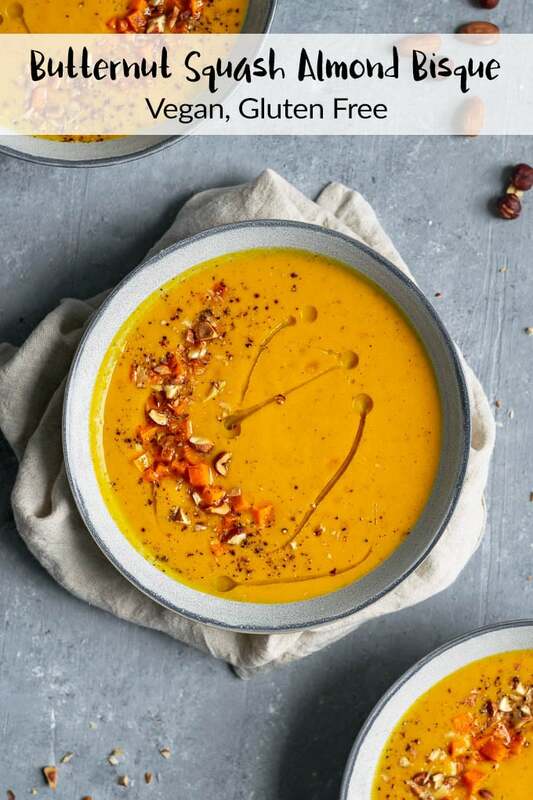 I hope by now I’ve convinced you to add this butternut squash almond bisque to your holiday menu, and maybe also test it once, twice, three times (??) beforehand, and probably once after for good measure. The soup is great made 1 or 2 days in advance if you have the space in your fridge, as the flavors just meld overnight and the soup is even better the next day! And a recipe that can be made a day in advance is a gem for thanksgiving day (or Christmas dinner or whatever holidays/Thursday nights you celebrate). 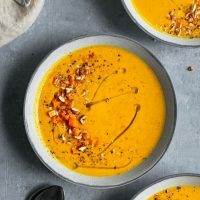 If you make this butternut squash almond bisque, let me know how it goes! Leave a comment and rate the recipe below! And tag your recreations @thecuriouschickpea and #thecuriouschickpea on Instagram, I absolutely love seeing your photos! The soup is even better the next day so try making it in advance! You can substitute the almond butter for hazelnut butter, or if allergic to nuts try a sunflower butter. Use tamari for the soy sauce if gluten free. If soy free try liquid aminos. Coconut aminos for soy- & gluten-free. I’ve provided weight and volume measurements for the vegetables for easy increases or decreases to the recipe (and because who ever knows what 1 large onion really means!). Weights are for the prepared vegetables, so after peeled/diced/seeded. That being said, the soup isn’t that fussy so you definitely don’t have to weight your ingredients for good results (with the exception of the squash, I recommend weighing that at the store to choose the right sized one–or buy the right amount of pre-cut squash). 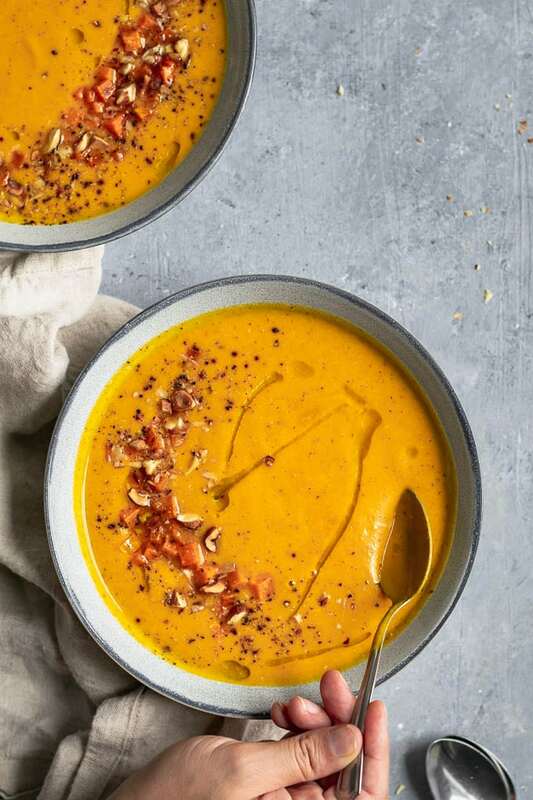 This mouth watering butternut squash almond bisque is perfect for fall. The butternut squash shines in this pumpkin-spice scented soup. This easy recipe is a staple on our thanksgiving menu! Heat the oil in a large stock pot over medium heat. Add the onion, carrot, celery, and ginger and cook for 10 minutes until softened, turn the heat down if it starts to brown or stick to the bottom of the pan. Add the butternut squash and cook for another 5 minutes. Add the vegetable broth, soy sauce, 1 tsp of salt, cinnamon, and nutmeg. Bring to a boil then turn the heat down and simmer for 10 minutes, or until the squash is very tender. Turn off the heat, remove the cinnamon stick and stir in the almond butter. Blend the soup with an immersion blender or upright blender (be careful to vent if blending hot soup) until it's smooth. Return to the pot and add salt and [lots of] black pepper to taste. To serve, garnish with your choice of toppings, or keep it simple with some freshly ground pepper and a drizzle of olive oil. I was just thinking this morning that I want to try a new soup for the holidays and here is this beautiful recipe! I will definitely be trying this one, thanks!! I’ve never liked butternut squash but my aunt gave me one and I didn’t want to waste it. I took a chance on this recipe and I’m so very glad I did. This soup is AMAZING.